Heres the finished product. Im quite pleased with how it turned out. There are loads of guides on how to use the ATX supplies on google. I read through a few to get an idea of what I could do. 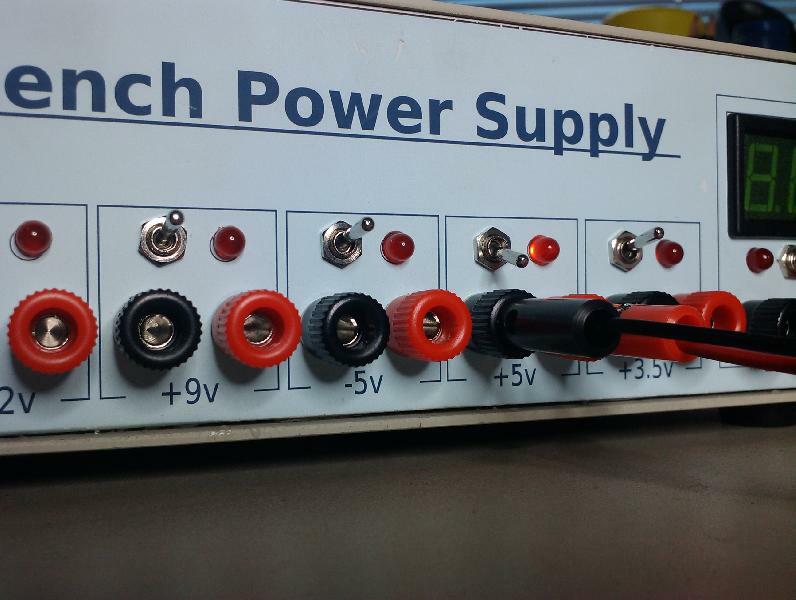 12v, 9v, 2x5v, 3.5v and a variable supply. They are all available on screw posts with 4mm sockets. Each is switched with an LED indicator to show when the power is supplied. The variable supply is switched with an LED indicator and the meter shows the voltage. 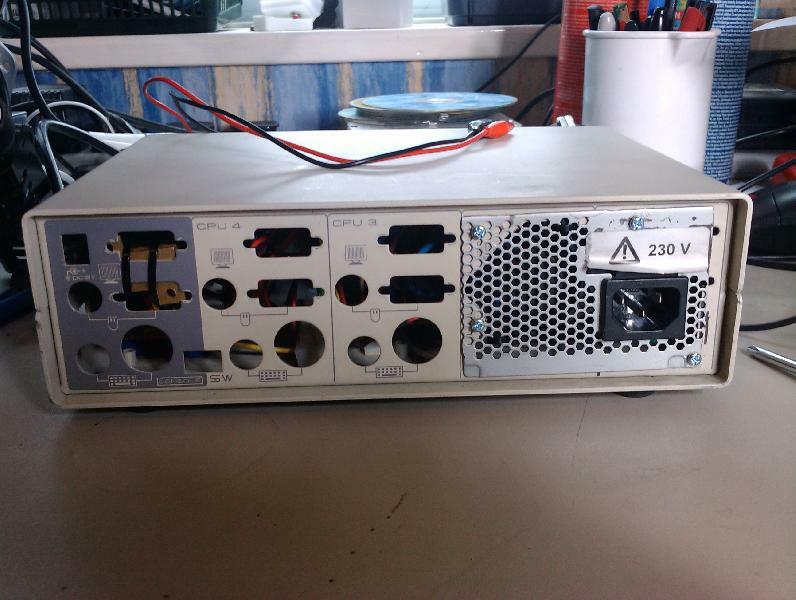 The mains 220v supply is switched at the front and there is an LED indicator for this as well. Inside I have an ATX PC power supply stripped out of its metal casing and fixed into my metal case. Ive taken the power socket and fixed it onto the back plate of the case. Im using a smaller 12v fan to fit beside the power socket. Some power supplies like this need a load to stabalise the output so Ive used a ballast resistor. Take note there are 2 wires that need to be connected together to turn on the ATX power supply. Also look out for the sensor wires that give feedback to the supply to stabalise the voltages. All this can be found in the guides I linked to above. 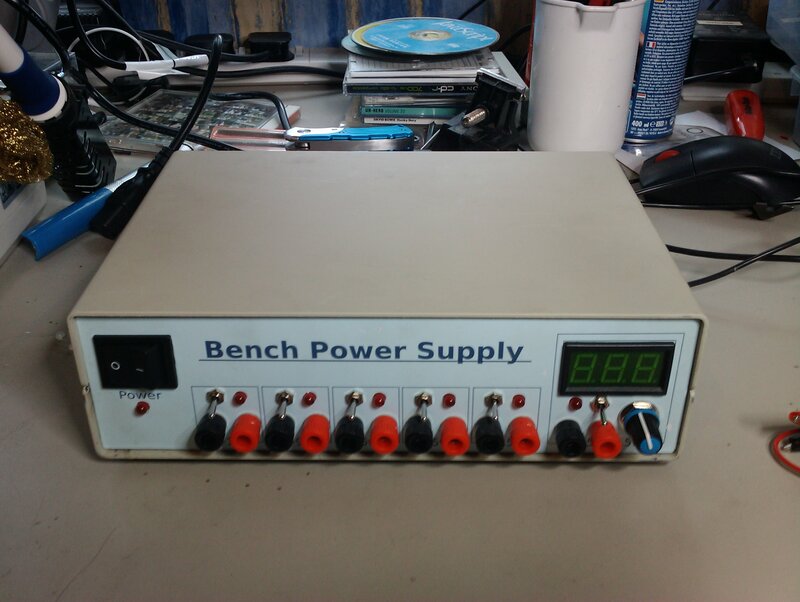 The case is an old KVM switch Ive had laying around for ages gathering dust. Its ideal for this as the whole case can be grounded. 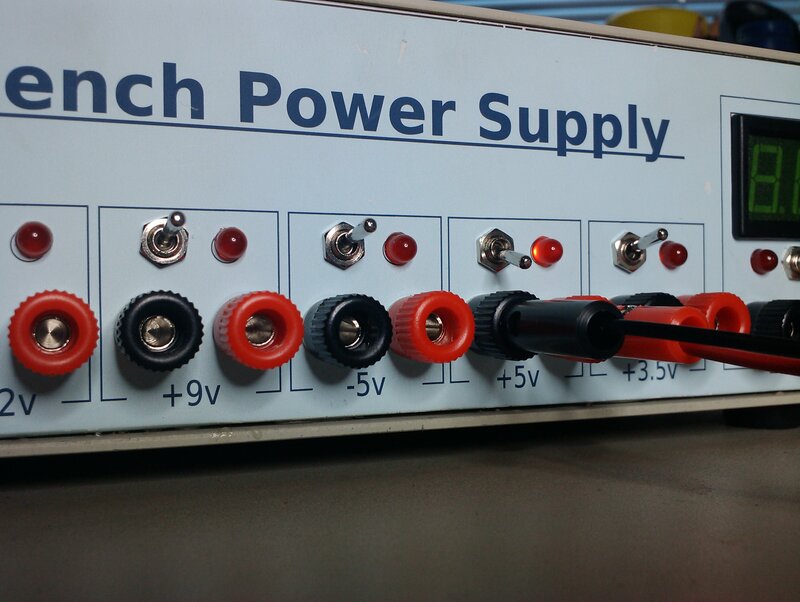 12v, 5v and 3.5v are taken directly from the ATX power supply and connected to the switch and then to the red post. The LED is connected to the back of the posts with a 1k LED, 1k as otherwise it would have been too bright. 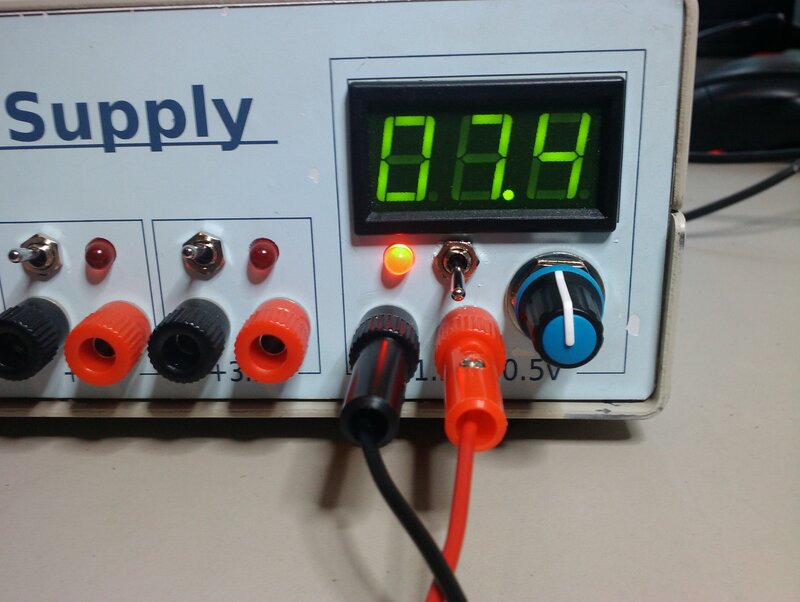 The 9v supply is from an LM7809 regulator connected to the 12v supply and an LM317 is used for the variable supply, again connected to the 12v supply. The switches and LED's are connected in the same way. The meter is connected to the back of the posts for the variable supply. 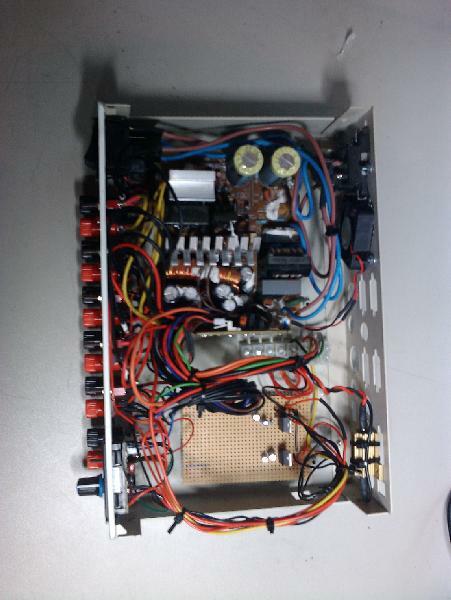 The regulators and other components are mounted on a piece of stripboard, with plenty of space to make changes or improvements. 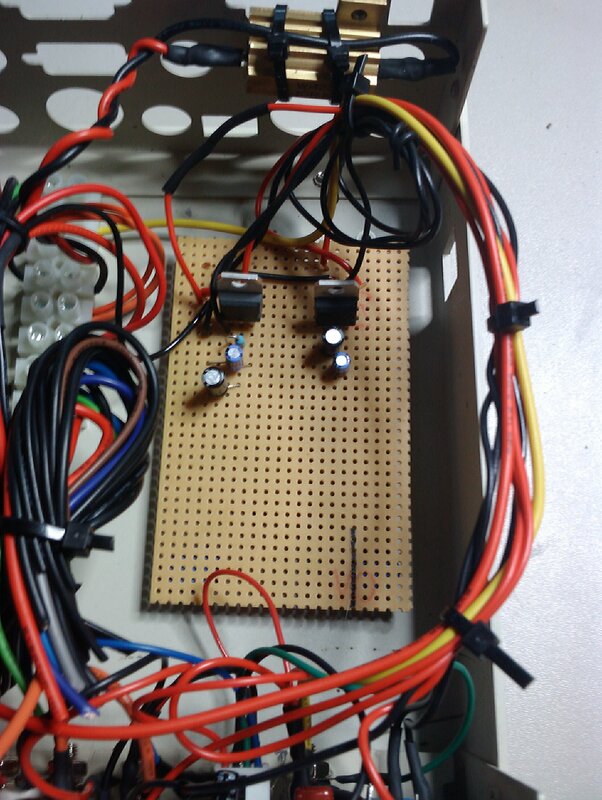 At the moment I can only get between 1.5v and 10.5v due to the limitiations of the LM317. Id like to get the full 12v range so will look into this later. Im really pleased with how the case turned out especialy the front panel. The panel is white 3mm plastic drilled out on my bench drill and finished with a Dremmel for the square holes. I produced the graphics and template for the front panel in Inkscape. Inkscape was ideal as I could work in millimeters and see eactly how it would turn out on screen. The graphics are printed on white inkjet printable sticky back vinyl. A great find I had no idea this existed. The back is a bit messy, Ill think about tidying this up at some point. But you can see the case came from a KVM switch. I considered putting fuses on all of the supllies but the ATX power supply is very well protected and you just need to remove the mains power to bring it all back up again. Im going to put some insulation between the wiring for the front panel and the main ATX supply board. Im sure this will evolve as I use it and it will be easy to change things as I go. And also Im sure there are details of the build I could add to this document. As I think of them Ill update this document.